Amp up your tone with these hot wound Dragonfire AR5s designed with dual blade rails on a full-encompassing bobbin for a sleek, modern and complete look. These are humbuckers in the size of a standard Strat single coil so you don’t have to carve up your body in order to get the humbucking features and versatility you want. Not just for Strats, these are some of the hottest passive pickups out there and can be used in any standard single coil space (not tele-sized! ); check the measurements provided prior to purchase and let us know if you have any questions. 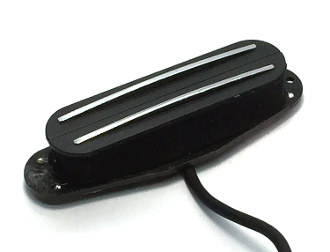 The AlNiCo 5 (AV) magnets in these pickups are highly charismatic and provide warm, smooth tone for a less harsh result compared to ceramic pickups. Alnico magnets can help provide you with a well-rounded, focused and dynamic performance while still allowing for plenty of attack and coherence. These are dedicated position pickups for performance enhancement and differentiation. Each pickup is wound specifically for a particular position so these pickups are not position interchangeable. The Middle position pickup is Reverse-Wound and Reverse-Polarity (RWRP) to ensure the best possible set execution and collaboration. The dual Blade Rails featured in these pickups help you avoid string-to-string definition loss and provide strong string response in a variety of playing styles. They can give you an even dynamic for sweep picking and are preferred by players who want to help make sure bends and vibratos will not choke out. Explore your boundaries with these 4-wire pickups providing humbucking performance and the ability to coil-split. You can also add series parallel functionality for even more flexibility and control. Spice it up and take advantage of these wiring options afforded to few Strat pickups.